In this, the longer, better version of BvS, more focus is placed on those whom our heroes are supposed to be protecting in the first place. In the “Ultimate Edition” of Batman v Superman: Dawn of Justice, there is a brief sequence of scenes which twists all the film’s sprawling thematic threads into an ambiguous, amoral knot. Improbably, it begins with Jon Stewart. In his cameo, Stewart delivers a brief monologue in the style of The Daily Show that riffs on the idea of Superman (Henry Cavill) no longer wanting to be seen as an American hero. Stewart suggests that this might be difficult, since Superman has the red and blue on his uniform, and an “S” (as in USA) on his chest. We notice that there is no audience reaction to this monologue, either because they neglected to add it in post-production or because Stewart’s jokes aren’t funny. What’s more interesting is how the camera pulls back to reveal that the program is being watched by an anonymous kitchen worker. When his boss tells him to forego the indulgence of Stewart’s post-ironic liberalism in favor of serving champagne to the rich folks up above, he obeys, leaving the question of Superman’s national identity to those with the luxury to debate it—those like Bruce Wayne (Ben Affleck) and Diana Prince (Gal Gadot), for example, two of the aristocrats partaking of that champagne at a higher elevation. This kind of thing happens a lot in the longer, better version of BvS that was recently released to home video along with the theatrical cut. Our heroes and anti-heroes cede the screen, if only for a moment, so that the less powerful and influential can remind the viewer whom these superhuman gladiators are supposed to be protecting in the first place. This Machiavellian point is made with a little more poetry in the moment where Batman and Wonder Woman first sip champagne together. This scene is partially intact in the theatrical version of the film, but the extended cut gives it more time and emphasis. (This is often the main difference between theatrical and director’s cuts, and it’s not insignificant: Time carries a lot of weight in film.) Diana Prince is invited by a covetous museum curator to look at his prize possession, which he earnestly believes to be the sword Alexander the Great used to cut the Gordian Knot. In the popular version of this legend, Alexander comes to a Phrygian town whose big tourist attraction is a former king’s ox cart that had been sanctified and tied to its pole for centuries. Alexander, unable to untie the knot after much effort, opts for a more direct solution: he takes out his sword and cuts the rope in half. The thematic implications in the film are obvious: Batman, Superman and Wonder Woman don’t adhere to conventional methods of fighting criminals, because they are strong enough to not need to. Policy and principle are luxuries they choose not to afford. Even the museum’s veneer of legitimacy is beneath our heroes: Batman and Wonder Woman go on to discuss how the Alexandrian sword before them is actually fake. Aside from making the fussy curator look like more of a dope in retrospect, this piece of information could mean several things. The writers may want to suggest that political power is largely outside the hands of politicians. Or perhaps they want to undercut the distinction between political power and the kind of decentralized, internalized codes of societal discipline that, as Michel Foucault argued, are indistinguishable from knowledge. Apart from fighting bad guys, Superman and Batman are primarily gatherers of knowledge: Superman as a reporter, and Batman as a kind of detective. And their knowledge is always legitimized in a way that supersedes the kind of official truth represented by Senator Finch. Authenticity, whether it comes from inclusion in a display case or a formal declaration of war, does yield to force, but force is limited in turn by the social contexts that allow it to be authentic. How else does the most powerful being on the planet end up cowering before a government tribunal? Batman v Superman is not, of course, the first superhero movie to raise such questions about power and responsibility. This year’s Captain America: Civil War hit many of the same notes. But the conflict in that film felt staged and ultimately inconsequential: We see the Avengers destroy a populated building at the beginning of the film, but it’s in a high-profile event on the other side of the world—and more to the point, it’s a mistake. 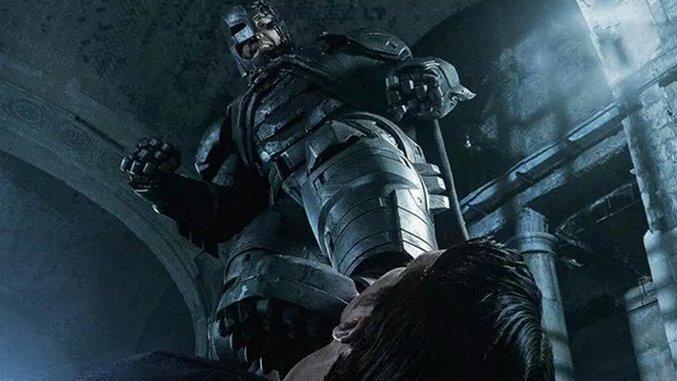 In Batman v Superman, Batman isn’t making mistakes. He is methodically torturing and branding criminals, setting them up to be shivved in jail. In other words, Batman is a systemic problem, habitually over-violent, instead of a Good Guy who occasionally misfires his batarangs. When Clark Kent interviews those affected by Batman (also in the Ultimate Edition), one of them warns Kent not to stick around after dark; another character responds that if he didn’t do anything wrong, he has nothing to worry about. With Batman, as occasionally with the American police, you’re guilty until proven innocent. As the parallels with Civil War suggest, Batman v Superman isn’t a very original film. And even in its longer form, I’m not necessarily sure it’s a good film: Those extra 30 minutes can’t do anything to make Jesse Eisenberg’s dumbfounding performance any more bearable. But it goes farther than any other film of its kind in testing our willingness to believe in idols, and in an era marked almost universally by civilian distrust in institutional authority, this feels like a necessary step for comic book films to take. And by giving so much space to those civilians affected by our heroes in its first half, the extended edition particularly distinguishes itself as an uncommonly humanistic—and realistic—portrayal of corporal power. Finally, the film should be lauded for making an attempt to shift focus to the real scum of society instead of colorful invaders from other planets. (OK, there is one of those too.) Some critics found it grotesque that this film has Batman targeting human traffickers—but if there really was a Batman, wouldn’t we want him to do that? Do we object because it’s aesthetically incongruous? Or do we object because we resent the filmmakers for reminding us that these people exist, when we just want to be entertained? Either way, the victims are left in the dark. It’s hard to imagine any principle or any policy that could make that an acceptable world to live in.